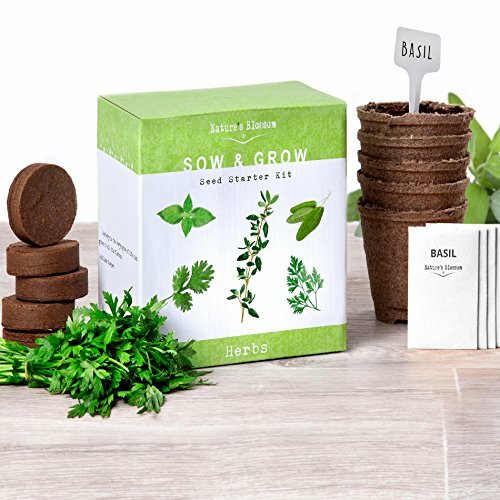 Nature’s Blossom's Herb Garden kit offers everything you need to grow 5 delicious culinary herbs from seed in one gift box. There's nothing like the taste of fresh herbs that were just picked from your own herb garden! Found in every ‘Top 10 things to grow at home’ list, herbs are both easy to grow & are an inseparable part of modern cooking. - 5 X Compressed Soil Discs - Made with a unique mixture of coir, it will expand 7 times its original size when watered. ✔ Unique gifts for any occasion - You can't go wrong with this unusual gift! Limited time special offer! Order this kit and get 10% off on our 4 Bonsai Trees and/or 5 Crazy Vegetables seed kits! ✔ EVERYTHING YOU NEED TO GROW 5 POPULAR CULINARY HERBS FROM SEED - Basil; Thyme; Cilantro; Parsley; Sage. Nature's Blossom's indoor grow kit contains: ✔ Seed starting soil pellets ✔ Biodegradable growing pots ✔ Plant markers ✔ Instruction manual. ✔ FUN GIFT IDEA FOR BEGINNER GARDENERS. For men or women, him or her, Nature's Blossom's seed starting kit is a great introduction to gardening. Grow your culinary herb garden with ease. Step-by-step sowing & growing instruction manual included.